Castile (plain olive oil) has a rich creamy lather leaving your skin feeling soft and full of moisture. It is wonderful for all skin types. Calendula is soothing to the skin and very moisturizing. Good for normal to dry skin types. Lavender Oatmeal gets its scent from lavender tea and ground lavender flowers; no fragrance or essential oils. Ground oatmeal adds texture. This soap has lots of lather and is good for normal to oily skin types. Full size bar is a generous rounded bar. Each bar is at least 4.5 oz but most are well over 5 oz. Sell these retail for your customers to use at home. Each bar has a cigar-band wrapper made from organic cotton paper. Hotel size bar is one-sixth of a full size bar. Perfect for hotels, B&B's, spas, and samples. Sold by the pound in brown paper bags. A pound consists of 18-20 bars. 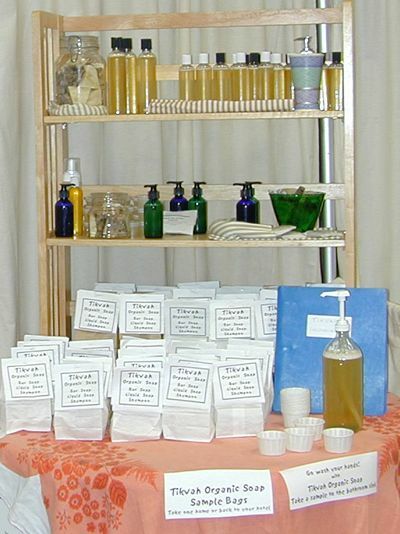 Offer your customers a choice of soap displayed in a basket, glass jar, or ceramic dish. Tikvah's Liquid Hand Soap is a rich, moisturizing blend good for all skin types. Sold in 4 oz colored glass bottles with pump tops. Gallon refills come in plastic jugs. Alternate sizes in glass or plastic upon request. Tikvah's Shampoo is an all-natural blend made from real soap. Sold in 4 oz and 8 oz clear PET bottles with flip caps. Gallon refills come in plastic jugs. Alternate sizes in glass or plastic upon request. Tikvahs soap is handcrafted from quality organic ingredients. We cut each piece by hand and make all our soap, soap bases, and teas from scratch. We never use fragrances, dyes, or mystery ingredients. We avoid plastics and chemicals during processing when possible and work in a scent-free environment. We package in glass or paper when appropriate. Bar soap is processed with sodium hydroxide and liquid soap with potassium hydroxide but there is no lye left in finished soap. All soap is made (saponified) with lye ("beauty bars," "bath bars," and most shampoos are detergents, not soap). Feel the difference organic quality means to your skin and hair!